Munsell arbitrarily divided the hue circle into 100 steps of equal visual change in hue, with the zero point at the beginning of the red sector, as shown in Figure 1. 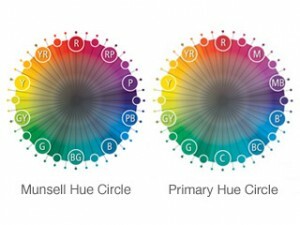 Hue may be identified by the number from 0 to 100, as shown in the outer circle. This may be useful for statistical records, cataloging and computer programming. However, the meaning is more obvious if the hue is identified by the hue sector and the step, on a scale of ten, within that sector. For example, the hue in the middle of the red sector is called “five red”, and is written “5R.” (The zero step is not used, so there is a 10R hue, but no 0 YR.) This method of identifying hue is shown on the inner circle. Understanding the Munsell color space. Learning how to read a Munsell color chart.